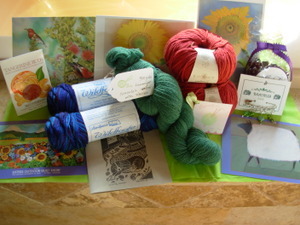 First off, I've been meaning to show you the prize I sent to Dani in my blogiversary contest. I found a few yarns in my stash that have been lingering too long, a bunch of pretty note cards, a couple of sweet treats and a set of beautiful stitch markers. I think Dani was pretty happy! I also wanted to show some of the gifts I got from friends after my diagnosis. There are so many pretty handmade things. 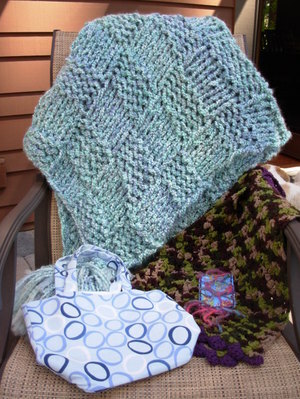 First of all, there is this cozy blanket knitted by Robin from Imagination Tribe, the prayer shawl that is crocheted by my local friend, Sarah, and this handmade bag from Deanne to carry projects in. 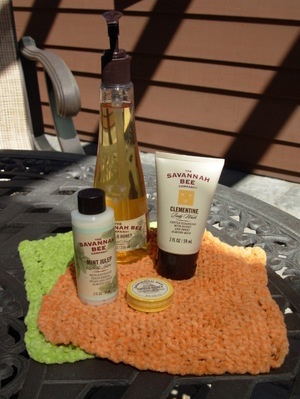 Jenn, the amazing friend who organized the Healing Basket, made these supersoft knitted face cloths. 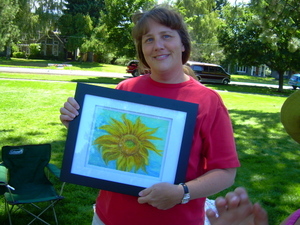 My friend, Myria, is an amazing artist and she made this beautiful sunflower with pastels. 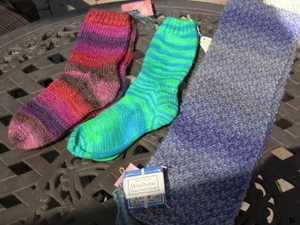 Here are socks knit by Pam and Jill and a scarf knit by Pam. Aren't they all beautiful? 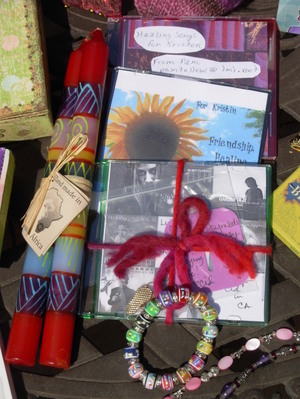 I also got hand mixed CD's, candles and several bracelets. 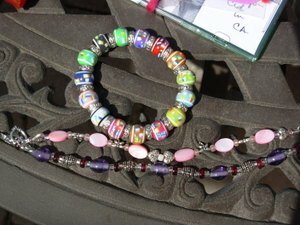 Here are the bracelets close up. The top one was given my by my mother-in-law and is from Friends of Mel. The other two are handmade by my friend, Kim, and by Zenmomma, Mary. 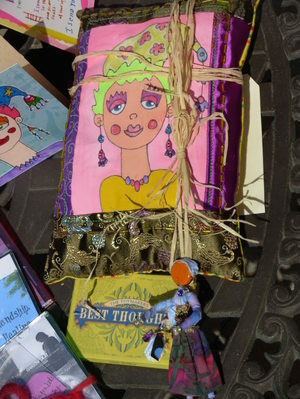 The hand painted lavendar filled pillow and wish doll (for Chloe) are from Robyn. The Best Thoughts cards are from Deanne. Toy Maker has really nice graphic paper arts that you can print at home and cut out. Definitely worth checking out! 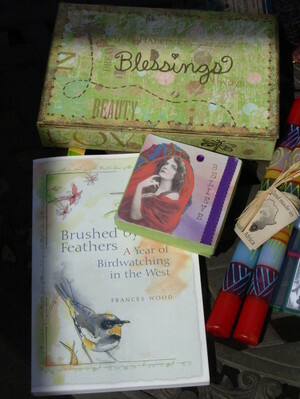 Jenn made the Blessings box and filled it with Artist Trading Cards sent in from friends at Imagination Tribe. Jenn also gave me the book which I've been reading slowly. It's full of essays about birds and is so well written I just want to jump in and be where ever the auther is talking about. Zenmomma made the Believe box to hold the bracelet she made. 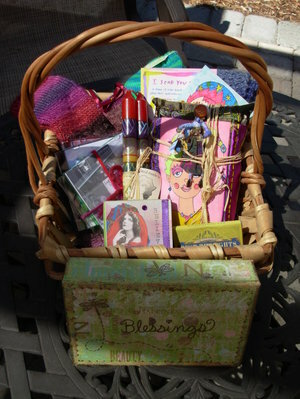 And here is the Healing Basket for presentation. Everything I received came from the heart and will always be cherished. Thank you all so much!